I'll be honest, the main reason I did the Challenge was to drop a little body fat and 'tone up'. It's not something I'm meant to say - a healthy, relatively slim 'blogger', we're not meant to discuss anything related to weight loss or anything that, god forbid, might suggest we're actually not fully loaded onto the 'self-love' bandwagon. Ultimately, my random efforts were rewarding me with random results. Which is why the F45 8 Week Challenge appealed to me -it provides a structured training program and a structured diet that, when followed, delivers results. Ultimately, I wanted to get my nutrition back on track. I wanted to fall in love with weights again. I wanted to get my body and mind back into focus. It's only 8 weeks after all? The workouts at F45 are nothing revolutionary. They're effectively combination of three of the most popular styles of training - HIIT (High-Intensity Interval), circuit and functional training. But it's a combination that has been proven across the world. It's a combination that works. The sessions are formulated by the F45 Head Office and rolled out to each day to every studio across the world, meaning it didn't matter if you were in Australia or the UK, every F45'er was doing the same session. I especially loved this aspect to the program, as you become part of something bigger than just yourself. It's one thing doing your own session in the gym, it's another being part of a 30 people class- it's a completely different matter altogether connecting with people on the other side of the world and discussing how brutal station 6 was, or sharing tips to 'try start on station 2'. It's the element of community that acts a support network, a support network so big it crosses the world. The number of times I woke up and just couldn't face a session, I'd watch instagram stories from fellow Australian F45'ers who'd done the same workout 9 hours earlier - seeing their energy levels would give me the motivation to get up and out the door. You just don't get that with a regular session in the gym. Whilst every workout is different, the classes follow a similar structure of stations, pods and a particular time in each. Time in each station can range from as little as twenty seconds to as much as a full minute; whilst rest between exercises varies from forty five seconds, to none at all. Take Wednesday Varsity for example, a cardio based workout that will "leave you grasping for any form of oxygen you can muster”! Completely different to Thursdays Roman's workout, a resistance based class, thirty-five seconds on, twenty-five seconds rest, meaning you can really up your weights and lift heavy AF. Whatever the combination of stations; Mondays, Wednesdays and Fridays always have a cardio focus (think rowers, bikes, burpees, plyo's); Tuesdays and Thursdays are resistance (deadlifts, pull ups, biceps curls and barbell squats); weekends are a combination of the two. All classes last for 45 minutes, apart from Saturday's Hollywood, which is an epic, sweat filled 55 minute special. A live DJ, a hybrid of cardio and strength, 27 stations, 40 seconds work, 15 seconds rest, 2 laps round the room - it's a killer, but you'll leave with such an adrenaline and endorphin rush you'll already be booking in for the following week! The question most people ask - does following the challenge mean you have to work out every day?! Absolutely not! F45 advise you aim for 5/6 sessions a week but, as with all these things, it really depends on where your coming from. If you've never been to the gym in your life, to suddenly start working out 6 days a week would likely be unachievable, unrealistic and actually quite unhealthy for your body. Equally if, like me, you work out on a regular basis, you will naturally want to visit more often. That said, doing much more than 6 sessions a week is FAR from encouraged - which I discovered when slipping into old habits a couple of times. As Haydn, co-owner at F45 Oxford Circus told me - we encourage you to go all out in one session, you shouldn't need two. Instead, spend the rest of the day giving your body the rest and recovery it needs to smash out the next session even stronger. That's the thing I love about F45 OC - the trainers aren't about getting you through the door as often as possible - they actually care about you and your results. Cooking is not my fortay. These were MEANT to be muffins. For me, the exercise is the relatively easy part - mainly because I genuinely love working out - however the nutrition is where I struggle! The past few years, my meals have consisted predominately of Deliveroo takeaways and eating out in restaurants. In fact, on day 1 of the challenge I had to ask my neighbour to borrow a tin opener (because clearly I didn't have any need to own one). His response - "did Deliveroo send you something in a tin?!" I CAN cook (although you probably wouldn't know it from the faff I went through trying to boil and egg. Seriously, nobody taught you this in Home Economics!) - I just choose not to. Until the Challenge, of course. The Challenge meal plan is very prescriptive - at the beginning of the week, you are given a shopping list for everything you'll need across the next 7 days. Compiled by a group of nutrition experts, each day the plan will tell you your 3 meals - breakfast, lunch and dinner - and 2 snacks - mid morning and mid afternoon - and give you recipes for all. Breakfasts range from scrambled egg and avocado, to protein pancakes or turmeric porridge. Lunches might be a salads or naked burgers, dinners; roasted salmon, steak buddha bowl or, my favourite, pork, mushroom and ricotta (rice-less) risotto. The first week, I admit, I was starving. But it didn't take me long at all to adjust to my new way of eating, and I actually began to really enjoy the food. 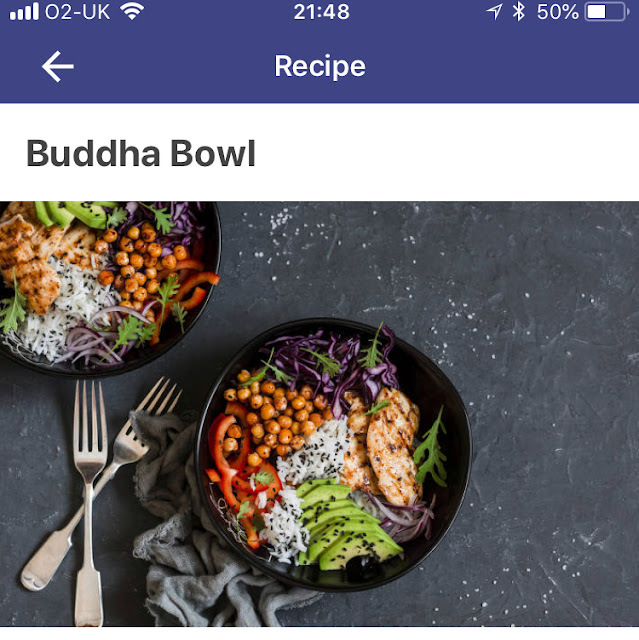 With two snacks a day, there was never long until your next opportunity to eat, and I also loved the variety within the menus - it became a stupidly exciting weekly occasions when your meal plan for the next week became available on the app! 1. Spring Training - a two week 'detox' to alkalise and cleanse the body. In order to do this, the menu plan removed all red meat, processed sugar, refined carbs and diary, focusing on lean poultry, greens and small servings of legumes (mostly in the form of chickpeas). In this phase, it is also recommended that you remove all caffeine from your diet - I admit, this is the part I did not stick to! Everyone is different but I personally don't think a couple of coffees would have any effect on my results - if anything, when I was craving something sweet and sugary, to be able to replace it with a black Americano and a spoon of Splenda was a godsend! 2. Regular Season - the longest phase of the Challenge, this four week block was focused on a high protein diet to support muscle hypertrophy, assist in muscle recovery and repair, create healthy fat loss results and build a strong immune function. Fat went up to approx 60g per day - higher than I'd ever gone before. Previously, I would have reverted back to my 'fat-free' ways, however having learnt to stick to plan and trust in the process, I fully enjoyed all the peanut butter, halloumi and full fat greek yoghurt the menu had to offer! 3. World Series - the final and, in my opinion, hardest two weeks of the plan, World Series focused on high fat, low carb, stripping fat and maximising muscle definition. Whilst carbs had been low throughout the previous six weeks (average 60g a day), here it dropped to 30g a day, coming mainly from veg, and I was surprised at just how much of a difference those 30g made. By the second week of World Series, I was tired, lethargic, lacking in energy - and had gone 'off plan' on more than a few occasions to give me the energy lift I was craving. Let me explain. After taking a week out for a trip to Australia, when I came back I wanted to supercharge my final weeks. Which is when I slipped into some old bad habits - i.e. taking multiple classes in one day, overdoing the workouts therefore resorting to sweet and sugary foods in an attempt to up my energy levels. In all honestly, I finished the challenge a little annoyed with myself. I stuck to the plan religiously before Australia - the rest days, the meal prep, everything - then after taking a week out, I disrupted my flow, and reverted back to old ways. Not completely, I still followed the plan about 75% for the final few weeks, but I learned that I'm very much an all or nothing person. I don't regret for one minute not living out a Tupperware whilst in Australia, but I was disappointed in myself that I didn't return to full Challenge mode when I got home. I had no reason not to. Which is why when I received my final body scan and got my results - 4.5kg weight loss and 4% reduction in body fat, I was pleased but, honestly, felt I could have done more. OK, so I realise now that my goal to lose another 3kg was very unrealistic, but given I was at at the same 4kg loss midway through - I'd effectively achieved NOTHING in the final 4 weeks? But that's when the scales don't tell the true picture. Because actually, it was the final 4 weeks where the vast majority of my body fat reduction occurred - meaning, I had lost fat and gained muscle. Finally, when I saw the pre and post challenge pics - THAT'S when I really saw just how much I achieved. No filters, no pose, no 'good lighting' - just real, honest, results. If you ask me would I recommend the F45 8 Week Challenge - I cannot recommend it highly enough. I will highlight, if you want results, you have to be prepared to commit. You have to be prepared to spending your Sunday night doing meal prep, to order a soft drink when you go to the bar, to push yourself in each and every workout - but I can promise you, stick to the plan, and the results you get will be so worth it. Smile couldn't be more genuine! Setting my alarm clock for 5am on a Monday morning to squeeze in a class before work was no easy task, but the moment I would step in the studio to be welcomed by the F45 Oxford Circus team with a big cheesy grin and a massive "HI HAN-SKI!!!" (my new nickname.... apparently). all moments of 'what the hell am I doing here' went out the window. Which brings me to the F45 Oxford Circus team. 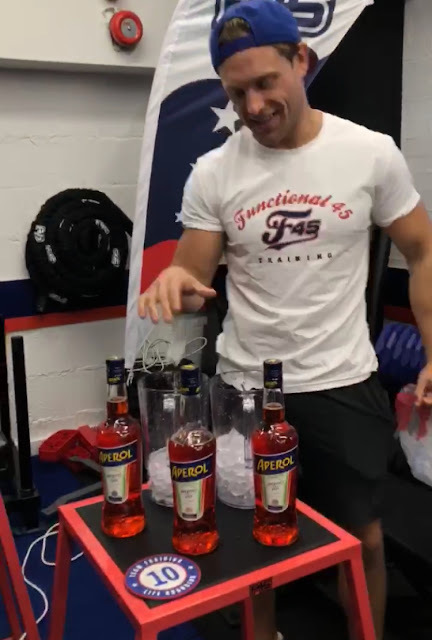 Even when in Australia for a week, taking classes in the mother-land of F45 itself, the standard, the energy, the vibes just didn't even come to close to the humongous amounts of fun we have at F45 Oxford Circus. No matter what the session, I could count on Haydn (co-owner) to always push me that extra mile - the moment he walks in the room you can literally feel the energy just lift. You could be damn right that Tristan (other co-owner) would greet you with a big grin before sorting out any non-training related query you might have (membership, adding classes on to the fully booked timetable, replenishing fire hazard hairdryers in the changing rooms, even recommending domestic services for your flat :P ). Then there's the dreamteam of trainers - Sana looking absolutely incredible even at 6am on a Monday morning, always able to spot when I could up my weights (even when I didn't think so myself), pushing me to the next level (....whilst also striking up a conversation in the worst possible moments. Mid box-jump-burpess, "What are your plans for the rest of the day girl?". Sana, I love you babe, but IM A LITTLE BUSY RIGHT NOW!). Finally, Hannah, Rachel and Arby, never failing to make me laugh out loud (even whilst turning up the resistance on my bike), correcting my technique and stopping that arching back, pushing me for that extra rep every single time. There's guys truly are the F45 dream team, and I without a doubt could not have done it without their never-ending energy, enthusiasm, support.... and promise of an EPIC end of Challenge Party!!!!!! Positive site. where did u come up with the information on this posting? I can't wait to read lots of your posts.Cheers for sharing with us your wonderful blog. I have visit so many time to this blog.This is very educational content and written well for a change.Some genuinely interesting info , well written and loosely user pleasant.